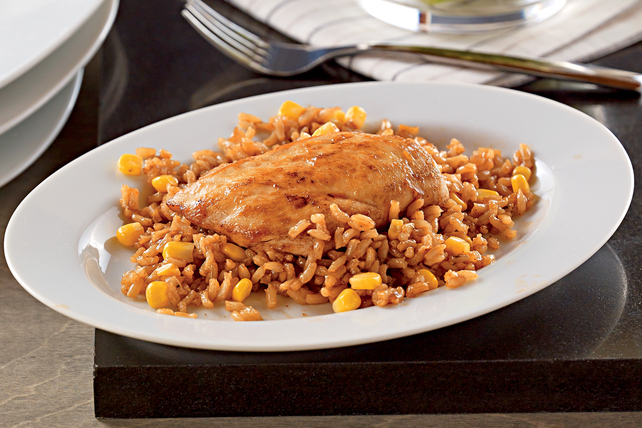 Tangy with BBQ sauce and ready to eat in just 25 minutes, this chicken and rice dinner could very well become your new favourite weeknight dish. Heat oil in large nonstick skillet on medium heat. Add chicken; cook 6 to 7 min. on each side or until done (165ºF). Remove chicken from skillet; cover to keep warm. Add water, corn and barbecue sauce to skillet; stir. Bring to boil, stirring occasionally. Stir in rice. Top with chicken; cover. Cook on low heat 5 min.